Balichak is a census town in Debra CD Block in Paschim Medinipur district in the state of West Bengal, India. 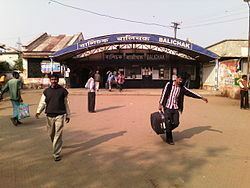 Balichak is 91 kilometres (56 mi) from Howrah on the Howrah-Kharagpur line and is part of the South Eastern Railway system. Balichak is located at 22.37°N 87.55°E﻿ / 22.37; 87.55. It has an average elevation of 12 metres (42 feet). It is located in the Debra CD Block in the Kharagpur subdivision of the Paschim Medinipur district. There are few Banks and financial houses that serve the people living in Balichak and nearby areas. While State Bank of India is the busiest of all, other banks like United Bank of India, Vidyasagar Central Co-operative Bank Ltd. also have their presence here. And United Bank of India has two branches here. SBI Branch is at station Road, UBI(Balichak Branch) near Balichak Bhajahari institution and UBI(Hamirpur Branch) is at Balichak station road, Vidyasagar Central Coop Bank is at Balichak daily bazar. State Bank of India also has e-corner with branch. Life Insurance Corporation has a satellite branch in Balichak. The Private institutions do business mainly in the investment area.